Potty Training Tips! – MOM Designed / CHILD Approved ! Potty Training Tips to Introduce and stimulate interest in potty training. This well planned workbook uses both visual and hands on interaction to ease the pressures of potty training on both parent and child, while adding some fun and humor. As the child’s first teacher, use this book with potty training tips to provide a positive learning experience, encourage imagination and help your child discover the independence and pride in using the potty by oneself! Who has time to read a novel on how to potty train? The 45 tips included were collected from moms who testified that they work. Stop searching the Internet pages and instead, have potty tips right at your finger tips. The tips offered in this book allow you to pick according to your child’s personality. What works for one child is not guaranteed to work for another. You know your child best and here, you can choose the best fit for your child. The book arrived much larger than we would have expected and contains many pages of activity fun using drawings and real black and white photos of children. It’s not just a book to read through, it’s an every day extended activity book. Parent and child can read the book each day over and over, but also interact with creative coloring and stickers day after day, page after page. With your help, your child can proudly check off each milestone they reach on the progress chart and in the end, you have a keepsake activity book with a congratulatory certificate in the back for potty training completion. ….As an added bonus, each page is perforated and may be removed from the book and hung in a place where your child will be reminded of the activity featured on that page. 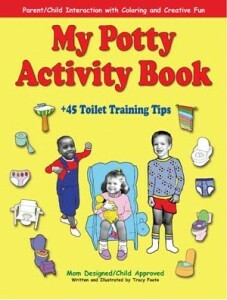 This book was definitely an asset to successfully potty training our son! Reviewer: Heidi Bowen from Atlanta, Georgia When I first heard about this book, I thought it would be yet another situation where the parents tried their best to con the child into using the bathroom… but to my surprise, this was not at all the case! I was wonderfully delighted to see that this book places the responsibility of using the potty right where it should be: in the CHILD’S hands! Instead of this book focusing on what Mom/Dad should do to responsibly teach their child to use the potty, the book and potty training tips focus on what the child needs to know to develop the responsibility to use the potty him or herself! Through the many activities in this book, your child is able to pull information from every direction and understand the “whys” and “hows” of potty training while at the same time, putting it all into action. I was amazed at how well this book incorporates many different aspects of using the potty in order to help the child understand that it is the natural thing to do! My Potty Activity Book + 45 Potty Training Tips really keeps the idea of potty training fresh in the child’s mind, right where it should be!